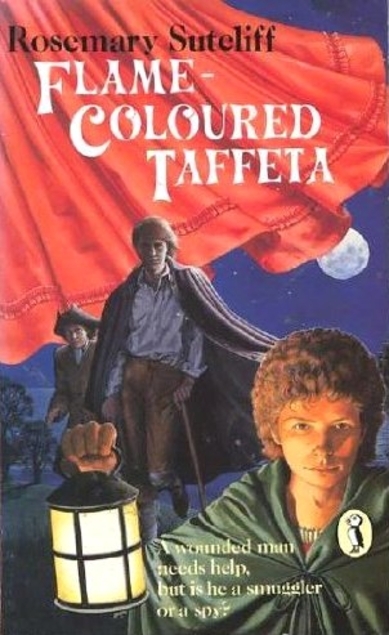 Flame – Coloured Taffeta by Rosemary Sutcliff is a Puffin book which was published in 1986. It was probably aimed at pre-teen children, but I intend to work my way through all of the author’s books – eventually. The setting is the mid eighteenth century and the coastal south-west of England between Chichester and Selsey Bill. It was a time of on and off war with France and just five years after the failed attempt by Charles Edward Stewart to get the Jacobites back on the throne of Britain. Damaris is a twelve year old girl who lives with her father and aunt on a coastal farm, an area which sees lots of smuggling activity, not that they call themselves smugglers, they’re known as Free Traders. Damaris is sure that she heard a gunshot during the night and she’s afraid that one of her local friends might have been shot, so she goes out searching her father’s farmland and discovers a young man, a stranger who has been shot in the leg. She needs the help of her friend and neighbour Peter to get the wounded man draped across her horse and they take him to their hideout in a tumbledown cottage nearby. He’ll have to share the place with the wounded fox that they’re nursing back to health. But have they done the right thing, is he a smuggler or is he perhaps a spy from France? This is a very quick read with just 120 pages and it also has well detailed illustrations by Rachel Birkett. I enjoyed this one, but then I do like stories featuring smugglers as many people do. I’m not sure if that’s a particularly British penchant/weakness or if it’s more universal. What do you think? Pirates are another weakness of course, maybe it’s just that ‘bad guys’ seem more interesting! This entry was posted in Books and tagged children's literature, Flame-Coloured Taffeta, Puffin book, Rachel Birkett, Rosemary Sutcliff, smuggling story by Katrina. Bookmark the permalink.